Miso Butter Corn Ramen: Described as "たっぷりコーンの味噌バターらーめん", which translates as "a sh**load of corn on top of miso butter ramen", this ramen was...pretty good. I mean, I've been a little spoiled lately so I wasn't really expecting much. And it was good to see that they still wok'd the soup (a miso ramen tradition) with all the ingredients right before pouring it on top of the noodles. I didn't see much corn on top, but most of it just sank to the bottom. The butter really mellowed out the flavor. It's sort of like putting padding on the outfield wall. It lessens the impact of the miso but you can still taste it. I personally prefer it without the padding and enjoy the sting. You can also feel the butter coat your lips as you slurp. Sort of like kissing a girl (or guy if you prefer) who's wearing too much chapstick. The thick, 2x4 pieces of menma were sadly disappointing. They were too hard and it felt like I was chewing on raw sugarcane. Okay, maybe not that hard but it was very stringy. The chashu had good flavor but it felt a little too chewy. Alright, I've definitely become too picky. Alas, the noodles. I love Sapporo-style noodles. Good stuff! And the corn...is just sweet corn. Fyi: I wrote that ? above because a search of Ezo Fukurou using the Ramen Database didn't turn up any results. Does anyone know where the honten in Japan is? Great review! :) Thanks. 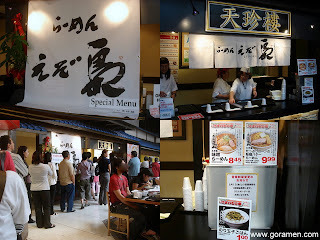 I liked the Ezo Fukuro Miso Butter Corn Ramen as well, but it was nothing compared to Chibaki-Ya's Shinasoba this year! :) We gotta go. Really? I wasn't impressed with Chibakiya at all. There was barely a line at Chibakiya when I went. Even Santouka had a longer line. It's funny that you say you've gotten too picky. I started writing about how the Chibakiya menma had good flavor but was too soft and decided *I* was getting too picky so I left it out!